It’s Monday, and due to the fact that I spent the better part of my Sunday sitting in traffic on I-40, all I want to do today is watch Netflix and play on Facebook as I normally would on Sunday. Unfortunately I have this stupid job thingy that’s totally ruining my plans. So I’m giving my brain a break and posting something simple and fresh that I wish I’d had for lunch instead of the cold chicken fingers I actually ate. The Chef served this vinaigrette over roasted shrooms and carrots, and I must say between this and the baby carrot recipe, he’s actively proving that they aren’t just lame ranch-covered OM-related snacks from my childhood. The Chef says this also works well as a marinade for lamb or beef. I cannot, however, vouch for lamb yet as that is one of the foods he has yet to make for me in an attempt to prove that it doesn’t, in fact, taste like dirt and barnyard like I think it does. I’ll keep you posted on that one. As many of you know, I started a new job this week, and I’m not entirely sure what I’m doing. And as it turns out, I’m not good at being clueless. At work, that is. I’m great at it on the weekends (See: the black eye I gave myself from tripping over Emily’s computer last Friday). Anyway, my confusion over words and acronyms I don’t understand stops now, which is why I chose to dumb-down The Chef’s title of this post from “crudo” to “salad.” That is the speed I’m running on, people, so shift back a gear. This salad reminds me of a simpler time when my biggest worry was what kind of wine I was going to drink alongside my Chef-prepared farm fresh MFM veggies… also known as last week. Seems like a year. Anywho, this salad was fresh and fantastic, and it was the perfect side to the Seared Scallops with Mango Vinaigrette. The adorable baby carrots we had with it didn’t hurt either (recipe coming soon). Slowly add oil while whisking. Place zucchini in a strainer and sprinkle with salt. Let it sit for about 10 minutes. 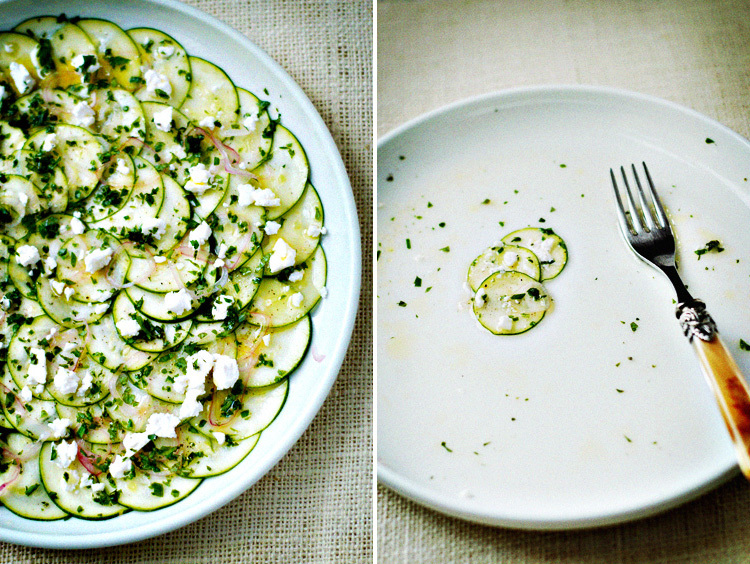 Toss zucchini with dressing and add walnuts. Top with parmesan cheese. Serve cold. With lots of white wine. While no one is grading me on keeping up with the posts to this blog during my time of extreme grad-school-related mental distress, I do not want to anger The Tanya lest she dump this blog for a newer, younger, sexier version. And then all you people would be left with is basic American appetizers. And soup. Cut bacon slices in half. 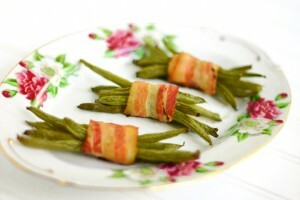 Wrap a bundle of green beans in the bacon and place them seam-side down in a glass dish. Drizzle dressing over the bundles. Cook for 30-45 min or until very crispy. 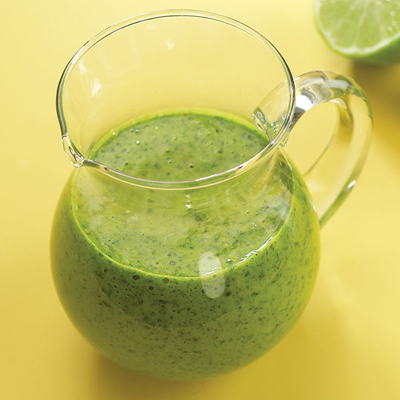 Continuing in the delusional vein that spring has just about sprung, The Chef brings you an easy salad dressing that will make you feel downright seasonal. This is another one that can double as a seafood sauce, so feel free to get creative up in herr-ah if you like. Mix all ingredients except the oils. Allow the flavors to marry for at least 5 minutes. Slowly whisk in oils until all has been added and the vinaigrette is smooth and thickened. 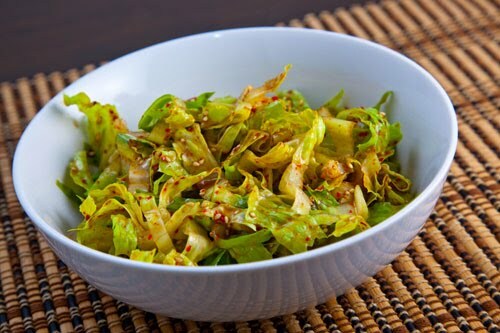 Serve on any spring salad or use it as a dressing for fish. Makes 2 cups.